“One child, one teacher, one book, one pen can change the world.” This quotation by the activist Malala Yousafzai illustrates the importance of every single little child that gets to enjoy a school education and no matter how little and unimportant it may seem, every child is essential for our future and every child has the right to go to school. For some of them, like Roma and Egyptian kids, it is just harder to get that chance of education and for those we have to fight. Of course, there might come up the question why it is so difficult in the first place to get those kids to a school registration. This can be easily answered – firstly, it has to do with cultural differences. In the Roma communities a lot of older members still believe, that education is not that important for their kids and girls are in most cases not even allowed to go to school, because they are forced to get married at a very young age, then they take care of their own children and are in charge for keeping the household clean and to bring food on the table. Secondly, even if those kids are able to go to school they often experience intolerance and discrimination because of their heritage. Their lower level of education has often as a result, they are often not able to keep up with the other children at the same age and that has a consequence that a lot of them drop out of school, some already in elementary school. So what does it take to get children mobilised, registered and motivated for going to school? From May to June 2018 there were five weeks of community visits and an “awareness campaign”. The main issue there was to train the children to a regular school attendance and to get children involved and scheduled. 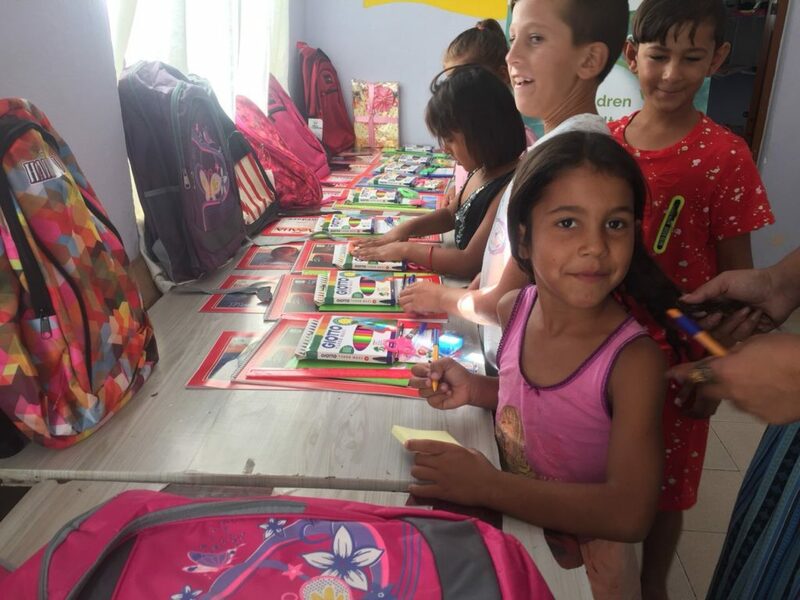 This may sound unnecessary, but the Roma parents are often not aware of time and date and of when they have to send their children to school, so teaching that to the children directly had a bigger cause. 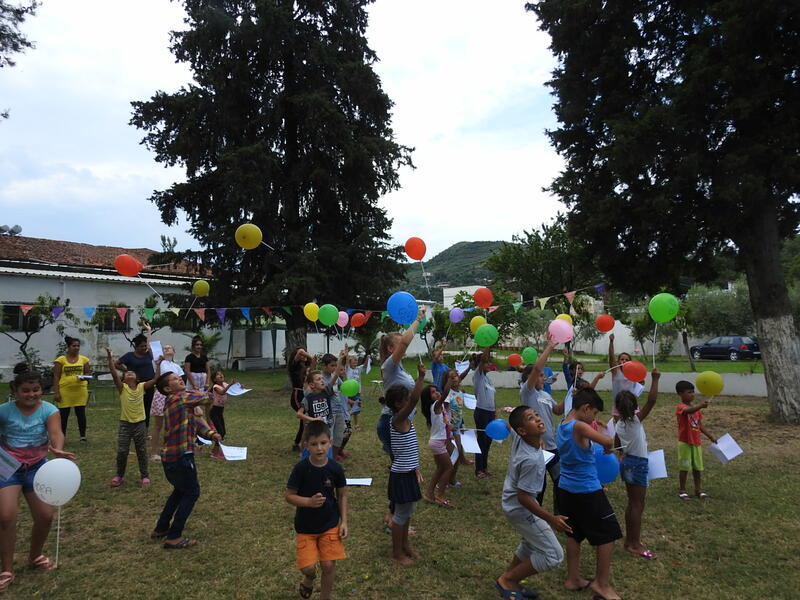 A little later, during the second and third week of June, there were two summer camps in order to build strong relationships among the kids, learn them social competences and to reinforce their decision to go to school together with their friends. From the end of August till the 13th of September there was an “awareness campaign” for the school registrations going on. It started with the registration of children going to school for the first time, the provision of documentation and registration to school and a round table with the teachers from Adem Gjeli school in Fushe Kruja to join our initiative. This initiative notifies ADRA whenever a child does not go to school for more than two days. Following, ADRA will go to the field, locate the child and work on a reanimation of their motivation. For an activity on the 13th of September in 2018 the volunteers from Germany, as well as children, created posters with important messages on, like “school is for everyone” or “I have the right for a school education”. 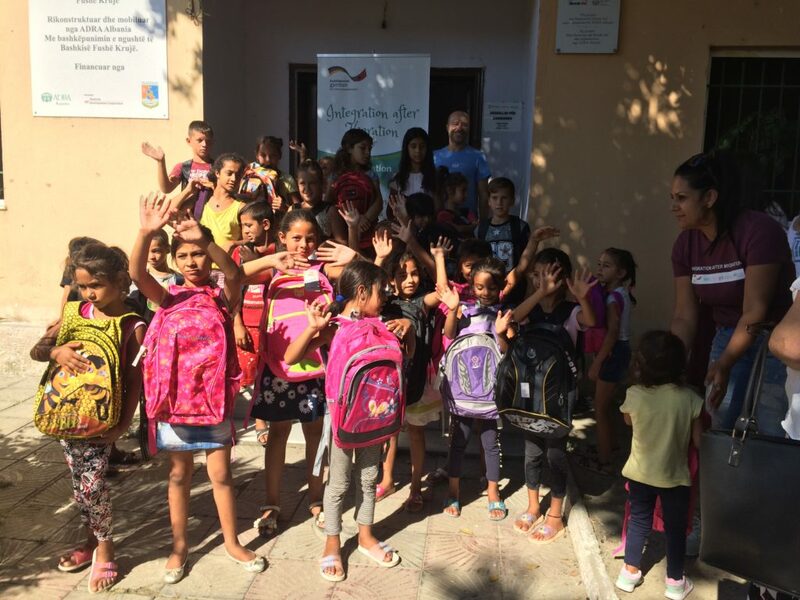 The operators of ADRA Albania, the volunteers and the children from the Roma community met up at the community centre and every single girl and boy received her and his first very own backpack, packed with school supplies. All those children laughing and giggling really warmed everyone’s heart. 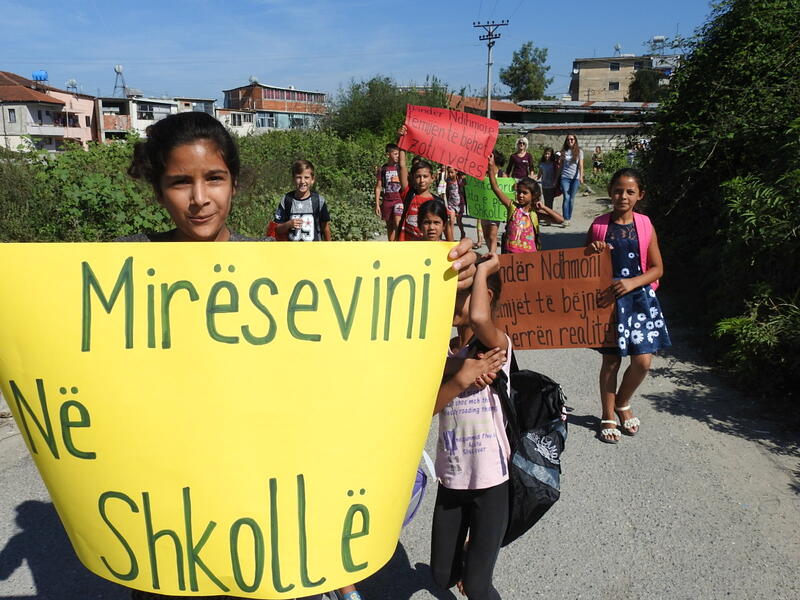 Afterwards, the kids took the posters and together, hand in hand, we marched through the Roma community, kids screaming for their right of education and their wish to go to school. These activities definitely created a lot of attention and hopefully lead to awareness among the parents and other family members in the community. The key in motivating a child to go to school lies in between the family. So we worked with parents and other members of the family to promote the value of education and a regular school visit, hopefully following, that they would push and motivate their children to the school attendance. The first days of school are, regardless of whom you are, how old and in which country you go to school, difficult for everyone. 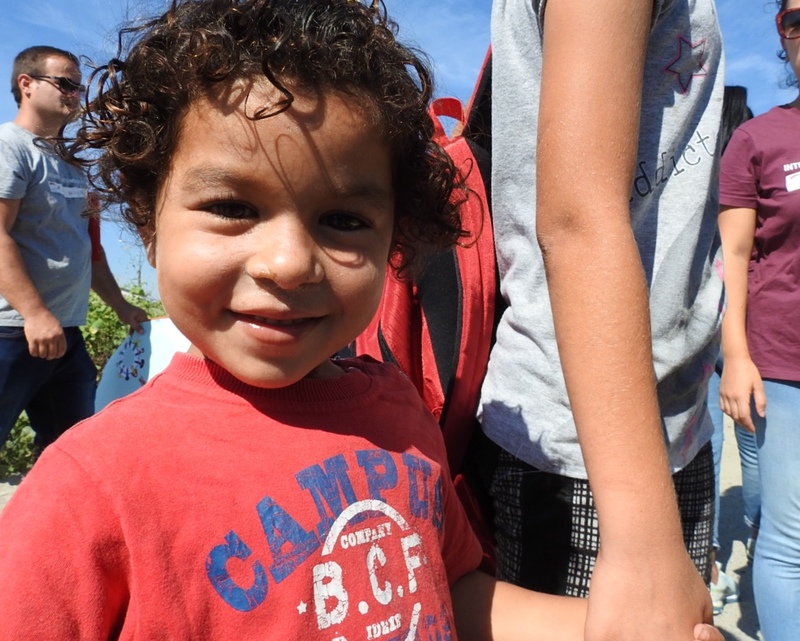 But how was the first week of school for the new registered Roma kids? This answer was provided by Mira, who is always on the spot in Fushe Kruja and works very closely with the Roma community and in the community centre there. 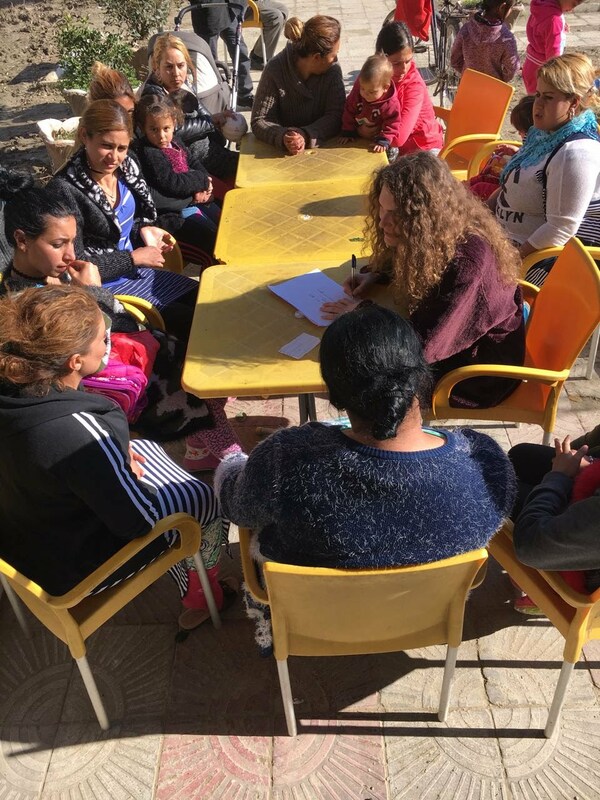 In her point of view the collaboration with the teachers worked out very well, because they enrolled the Roma children in their new classes and introduced them to their new class mates and also friends they already knew. A lot of kids were very enthusiastic on their first day of school, others had fear and felt a little anxiety, but everyone tried as hard as they could possibly do. Mira’s expectations for the first day of school were, that more parents would be present to give their children psychological support for the new experiences they were going through, but in this point she was a little disappointed. Nevertheless, the school attendance in the first couple of days was very frequent and the children really seemed to enjoy their new adventure. But we still have to present continuous support at all times to provide a regular school attendance. Another little story where ADRA Albania and the “Integration after Migration” project participated in was the return of a Roma kid named S. G. From Albania, who lived for two years in Germany with his family, more specifically in the little village Ronsdorf by Wuppertal, and also went to school there. 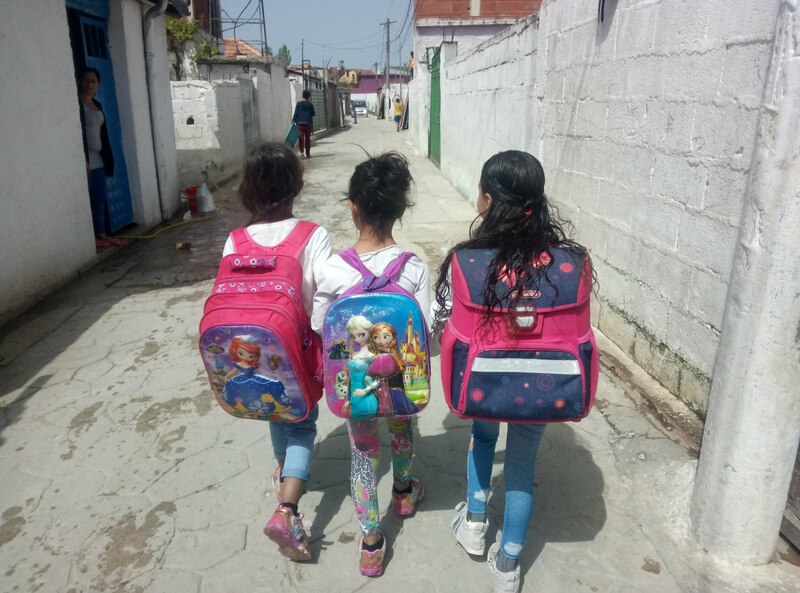 The problem was that the family did not remember the name of the school and also forgot to take the documents necessary for the registration to an Albanian school with them. So the German volunteers at ADRA Albania looked up all the Elementary schools possible, surrounding Ronsdorf. In the end there were about six possible elementary schools in that area, so they printed out pictures of those schools and then they were shown to the family – and in fact, the family recognized the German school of their son and so ADRA Albania was able to get in touch with the directory of the school. So far the German school replied, that they would be able to provide the necessary documents, but there was no further information to the present day. Hopefully everything is going to clear up and to work out for S. G.! Special thanks goes to support of the Deutsche Gesellschaft für Internationale Zusammenarbeit (GIZ) GmbH through the financies of the German Federal Ministery for Economic Cooperation and Development (BMZ), ADRA Austria and ADRA Germany.